Some Internet browsers require ActiveX Control software to be installed on your computer to view a video on your Linksys wireless video camera. The camera’s web-based setup page will inform you with a prompt that ActiveX Control needs to be installed in your computer. NOTE: The video output of the camera will be recorded as MP4 files. You will be able to view it using a media player with codec that can read MP4 videos. Examples of this would be Windows Media Player, K-Lite Codec Pack and XviD MPEG 4 Codec. IMPORTANT: This article assumes that you have already installed your Internet Home Monitoring Camera. If not, click here for instructions. Access the Linksys wireless video camera’s web-based setup page. For instructions, click here. NOTE: In this example, the Wireless-N Internet Home Monitoring Camera (WVC80N) is used. 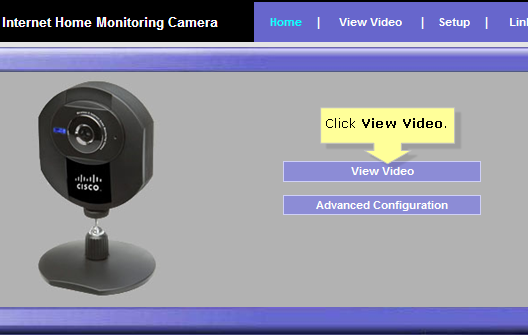 On the video camera’s web-based setup page, click View Video. An alert bar will appear, stating that the website wants to install the ActiveX control add-on: ‘LinksysMLViewer.cab’ from ‘Cisco-Linksys LLC’. Click Install. NOTE: The images may vary depending on the Internet browser used. A Security Warning screen may appear asking for your confirmation, click Install to proceed. The ActiveX Control software should now be installed in your computer.